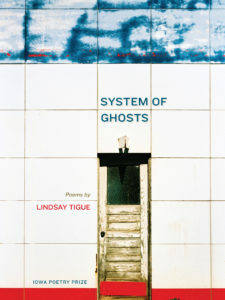 Lindsay Tigue’s System of Ghosts gives its reader a sharp observation about one’s isolation and individual environment. Her word choices are plain and used with reverence towards what they refer to. She brings a dead moment to life in “We are a System of Ghosts” when all of a sudden there is sense of awareness and realization after coming across a photo, once a valuable possession and now stranded in an Iowa blizzard, covered in flurry. Throughout the book, Tigue deals with memories related to loss and finding a purpose to continue life. In doing so she creates an emotional intimacy with her reader. Her style is fluent and she does not struggle for honesty when empathizing with her characters. In “Bliss,” she honors the untimely and tragic death of the first American pedestrian, H.H. Bliss, killed by a motor vehicle in 1899. She extends her respect by choosing his last name for the title of her poem, immortalizing a commoner whose name made it to the newspaper only once and then vanished in the archives. In “History of Rooms” I am amazed at how Tigue, with nostalgia, slips into what is forgotten when meandering around rooms that have now gathered dust, and is reminded there of Swedish meatballs and Irish coffee. So often the tone of this book has a presence of vulnerability that I find myself pausing as I read each poem, due to their suppleness rather than rigor. Transience has duality and Tigue does not compromise with it, but rather narrates it like a fable in “Minor Planets.” Her narrative style goes deep into the psyche of the reader to find purpose and meaning in outer space, and connects with life on earth by expanding on the self. She skillfully juxtaposes the name of Ceres, an asteroid, with the Roman goddess of agriculture, and links the goddess with the cereal grains in our daily breakfast. Tigue’s style is flexible, and she writes without the use of hyperbolic language. She moves swiftly and with freedom through the difficult nuances of the human condition, and connects all her thoughts in the center like a good literary work. In “How to Measure the Weight of Snow,” she scratches beneath the surface to re-evaluate the life of Chinese railroaders who constructed the Central Pacific railroad and were trapped inside a tunnel under tons of snow in 1866. Tigue brings her readers closer to the reality of hard labor and pares what really defines “hard labor” under harsh conditions. She incarnates the spirit of this passage of history and urges us to carry snow in a bucket before it melts so we can feel the pain of those forgotten workers who built the infrastructure of this nation. In many ways, System of Ghosts is a collection about physical dislocation and migrant memory. What is lost has been sifted through the flow of powerful poetry as an attempt to test one’s own capacity to breathe the very air of truth. In such a case, Lindsay Tigue casts out places such as the geographic spaces of America, the world, and our solar system. She brings us closer to understanding our own inventions, ruins, emotions, and the lost roots that leave us in despair and solace with the shadows of abandonment, and what they translate into in our psyche. System of Ghosts is not just a work of emotional catharsis, or a body of information; it is more an intricate composition of poems, stemming from deep thinking, and being in the moment. Vibha Rana recently earned her MFA in Creative Writing from Fairleigh Dickinson University of New Jersey, where she received the Provost Scholarship. Prior to attending Fairleigh Dickinson University, Vibha received her MA in English Literature from Agra University, India. Currently she is working on building her online networking business and a poetry book for future publication. Since 2014 she has served as a reader for The Literary Review.